MANILA, Philippines – Manny Pacquiao dominates Christopher Algieri, despite the latter’s physical advantages in an action-packed slugfest that ended in a unanimous decision victory for Pacquiao at the Venetian Macau today. 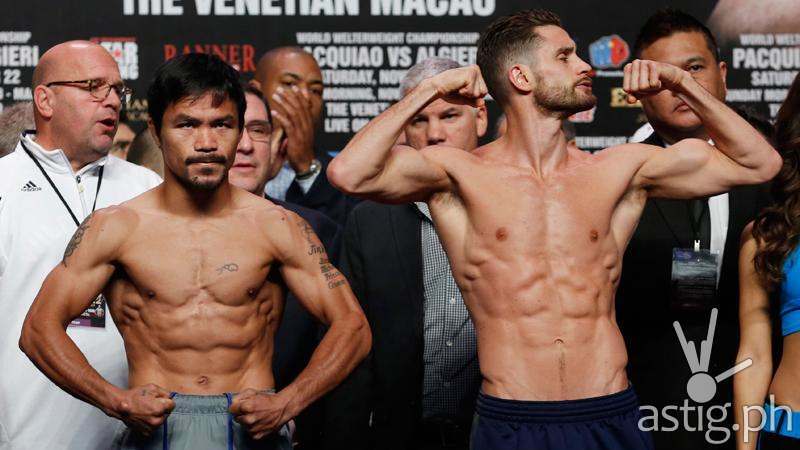 Manny Pacquiao knocked Chris Algieri down for a total of 6 times, but did not score a knockout. The fight ended with Manny Pacquiao retaining his title via unanimous decision. Pacquiao scored an early knockdown in the second round, catching Chris while he was moving backwards. He knocks Algieri again twice on the sixth and ninth rounds. A right hook on the 10th round resulted in the sixth and final knockdown. He’s going to fight me? YES! YES!!! – Manny Pacquiao on Floyd Mayweather Jr.
Chris Algieri went into the fight with a 4 inch height advantage and 6 pounds weight advantage. Prior to the fight the boxer from New York, USA Chris Algieri had a clean record of 20 wins with 8 knockouts and no loss. Algieri’s record goes down to 20 wins with 1 loss, while Manny Pacquiao’s record goes up to 57 wins, 5 losses, and 2 draws. “Well uh I think I’m ready to fight next year for him,” adds Manny. Hometown Kibawe, Philippines Huntington, N.Y.